The monumental scale of the docks and the presence of surviving dock infrastructure provide a unique physical and historical context for the regeneration of the Royal Docks. The area’s industrial heritage can be seen in the cranes that line Royal Victoria Dock and art that celebrates the people that have lived and worked in this remarkable part of London. 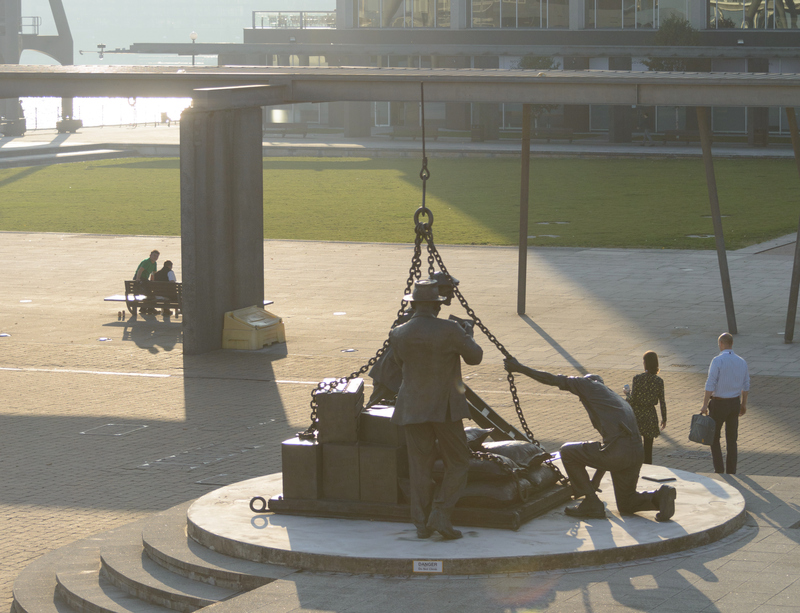 For example Landed, a sculpture by Les Johnson (below), stands outside the ExCeL centre, and pays tribute to dockworkers' history. These elements, as well as several listed buildings, give the area a character that continues to attract and intrigue locals and visitors. Nowhere is this more evident than in Lightship 93 and the iconic Millennium Mills building nearby. The former is a striking scarlet-painted ship moored in Royal Victoria Dock that has quietly been attracting some of the world's finest creative talent into the area for years as a floating photographic studio. Meanwhile, the Millennium Mills is a derelict turn-of-the-century flour mill that is currently undergoing major renovation as part of the £3.5bn redevelopment of Silvertown. Already a popular filming location, this building in the heart of the Royal Docks will be transformed into a mixed-use destination and home for creative businesses. The redevelopment of Silvertown and other post-industrial sites in the area is bringing about its cultural and economic resurgence by creating spaces for industrious artists, local enterprises, and businesses. The Royal Docks team and Newham Council are developing an ambitious skills and employment programme that will ensure local talent is at the heart of driving forward this transformational change.